Every timeI make risotto I make sure to double the recipe so that I have a lot of left-overs.As I noted in another risotto cake post, some restaurants actually make risottojust for the cakes. Once you taste one (good one, that is), you will definitelylook forward to the next one. When I madeChickenand Mushroom Risotto I made it really creamy. Really great as a risotto butit is a problem when you try to form a cake with the left-overs. I had no choicebut to mix it with little bit of bread crumbs to give it some body. To make thecake I chopped the leftover chicken and mushrooms, mixed them with soft goatcheese and formed a small ball. Then I formed ball with risotto, made deepindentation in risotto ball, placed goat cheese ball inside, enclosed it andflattened it to form a cake or pate about 3” in diameter and inch and halfhigh. Next came 3-step breading job: first, coat cake in flour, then beaten eggand finally Panko. Press the Panko in so it doesn’t get loose when placed inhot oil. I shallow fried the cakes till light golden brown on all sides. In 10minutes it was ready to be served with arugula and cherry tomatoes andfreshly grated Parmigiano cheese on top. 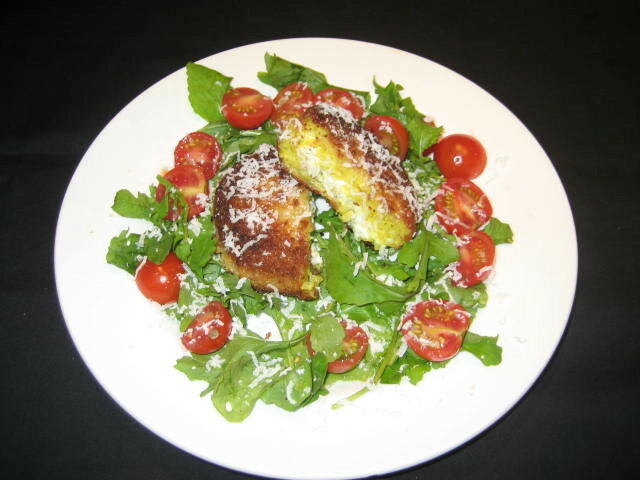 I just lovethe texture of crisp Panko on the outside and soft risotto and creamy goatcheese on the inside, all in one bite!